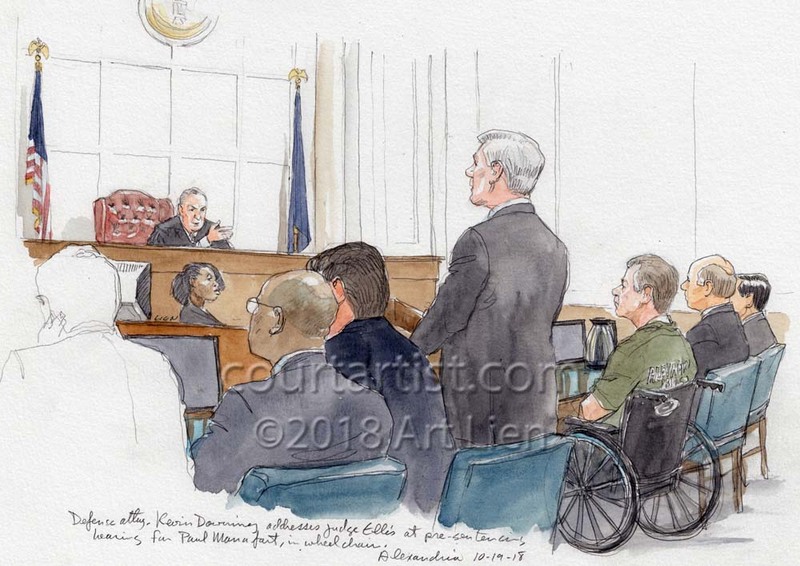 What can one say, yet another mass shooting. 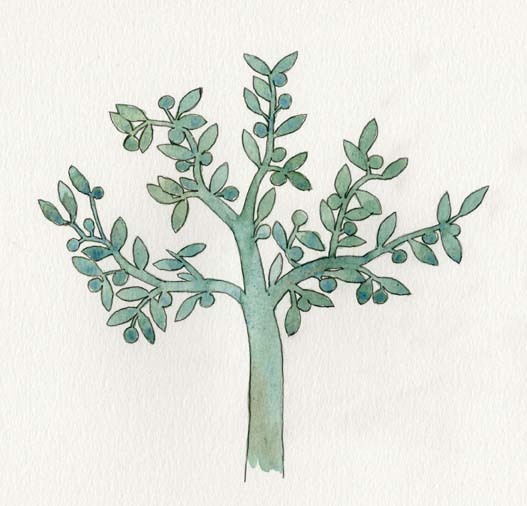 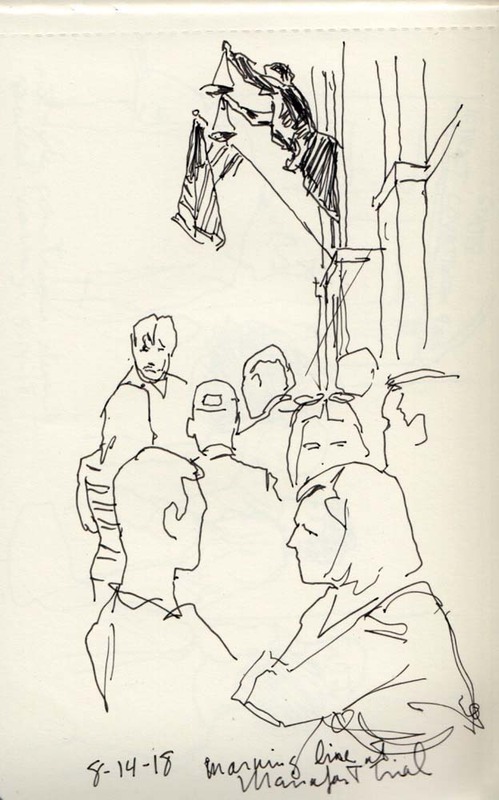 This time at Pittsburgh’s Tree of Life Synagogue. 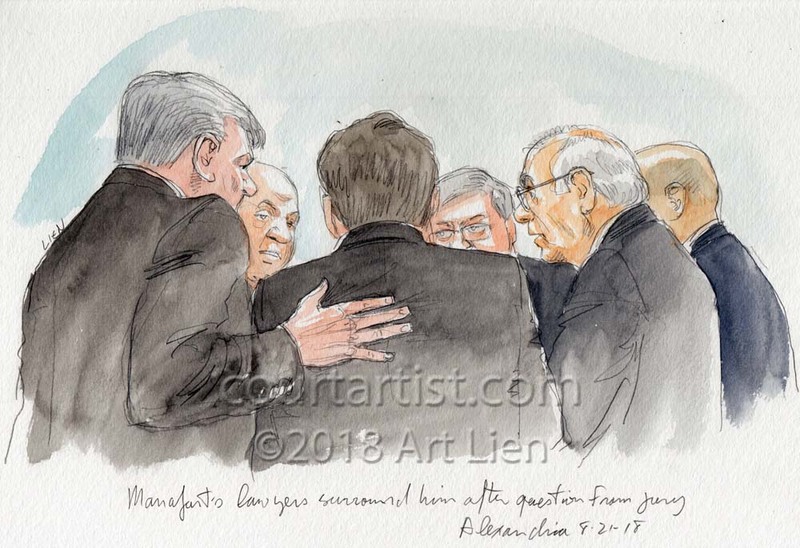 Eleven worshipers murdered. 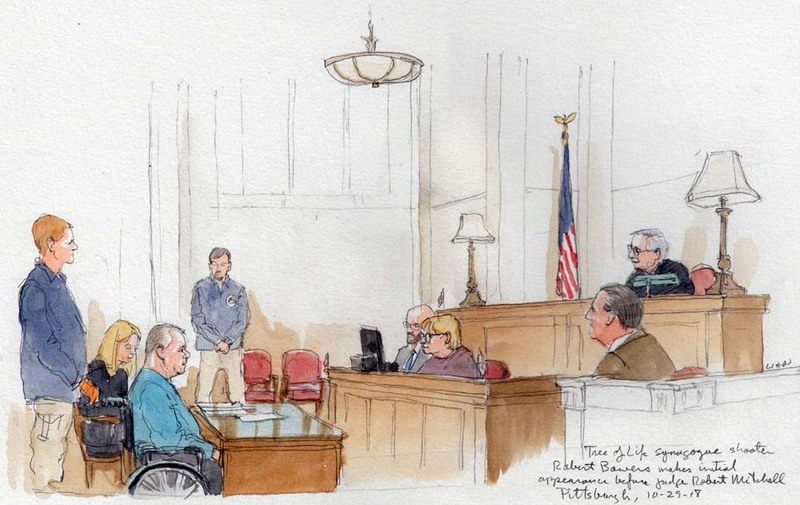 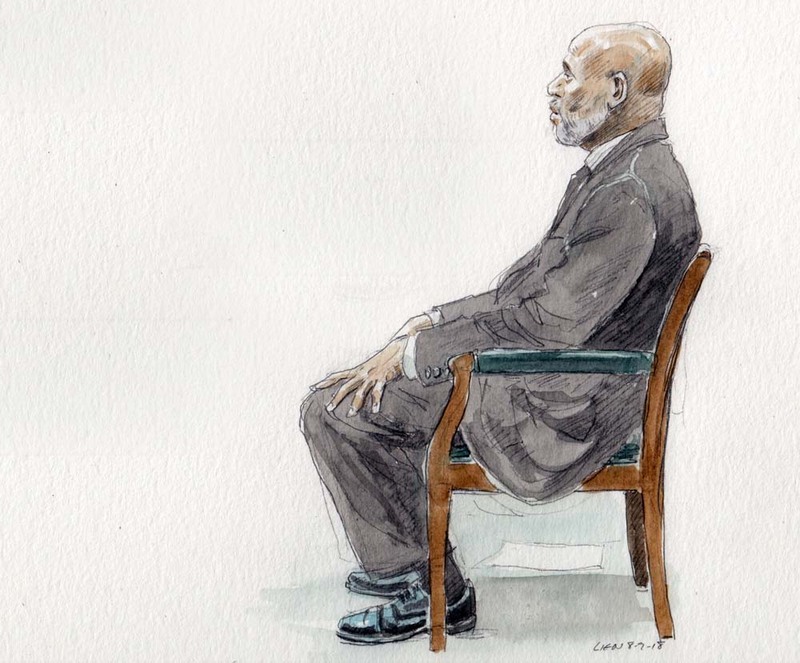 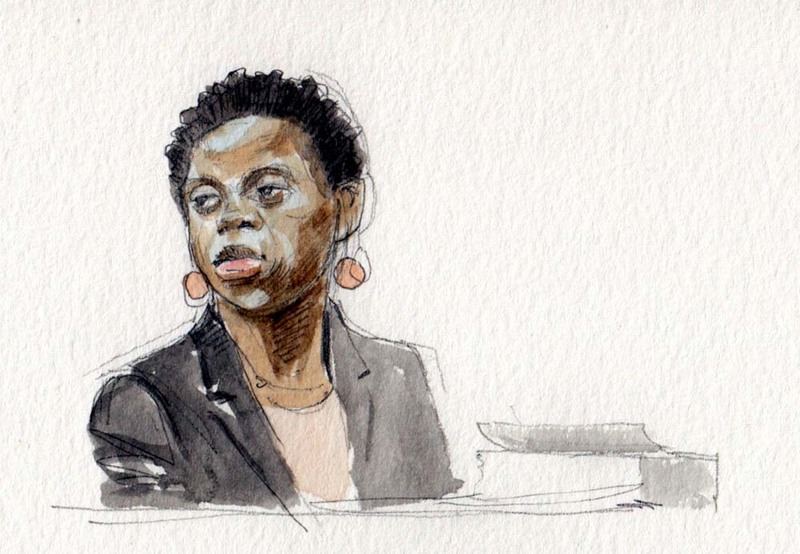 The shooter, pushed into the courtroom in a wheelchair, appeared remarkably unremarkable. 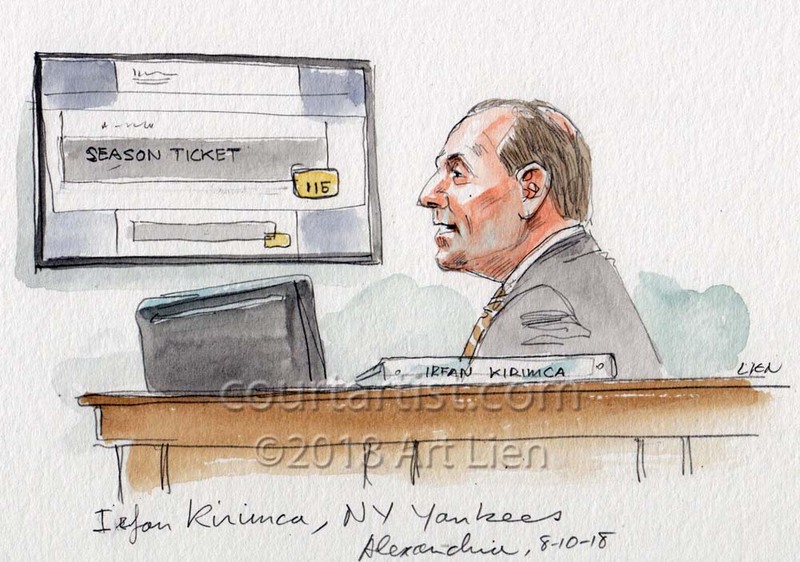 A poor pathetic shlub who became the instrument of evil. 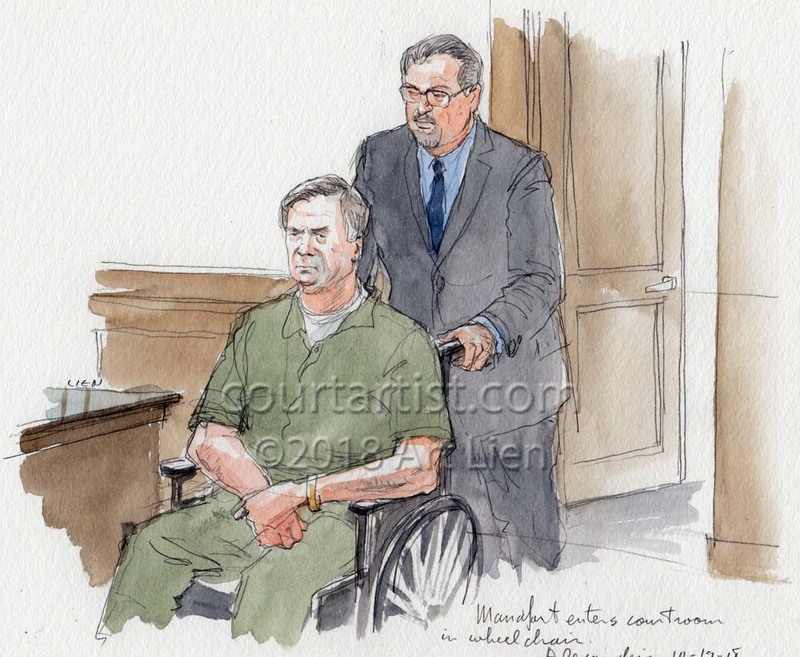 Former Trump campaign manager, and now convicted felon, Paul Manafort appeared dour as he was wheeled into the courtroom for a pre-sentencing hearing in Alexandria yesterday. 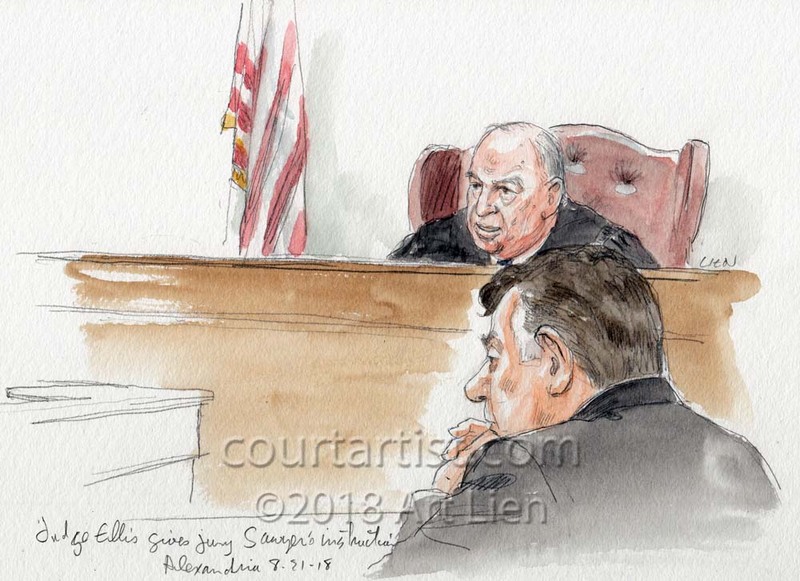 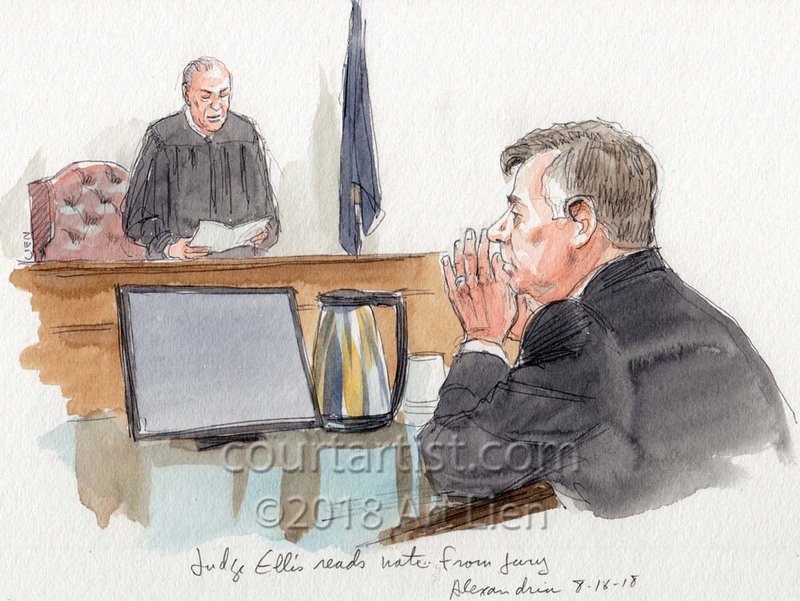 When Judge Ellis addressed him directly Manafort just stared into space. 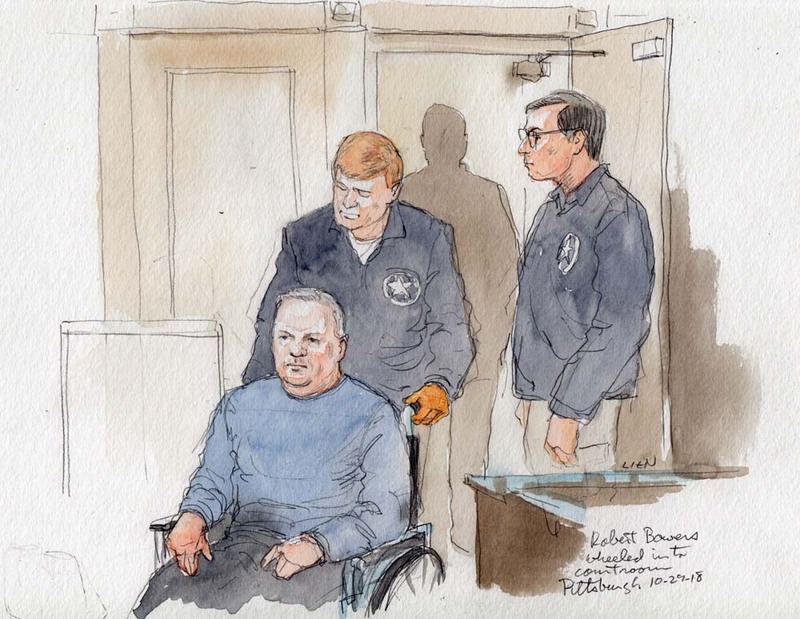 No details were given about his health, why he was in a wheelchair, or why his right foot was shoeless and covered with a thick white sock. 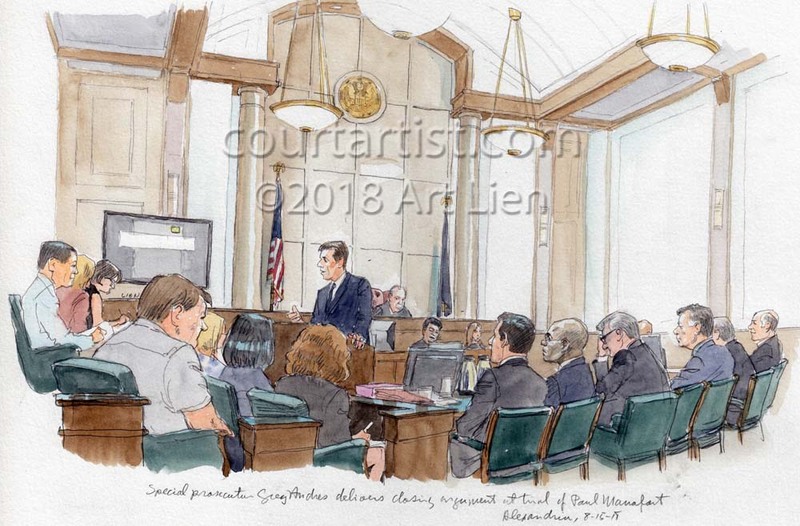 It is not unusual for defendants facing incarceration to develop “significant health issues” shortly before sentencing. 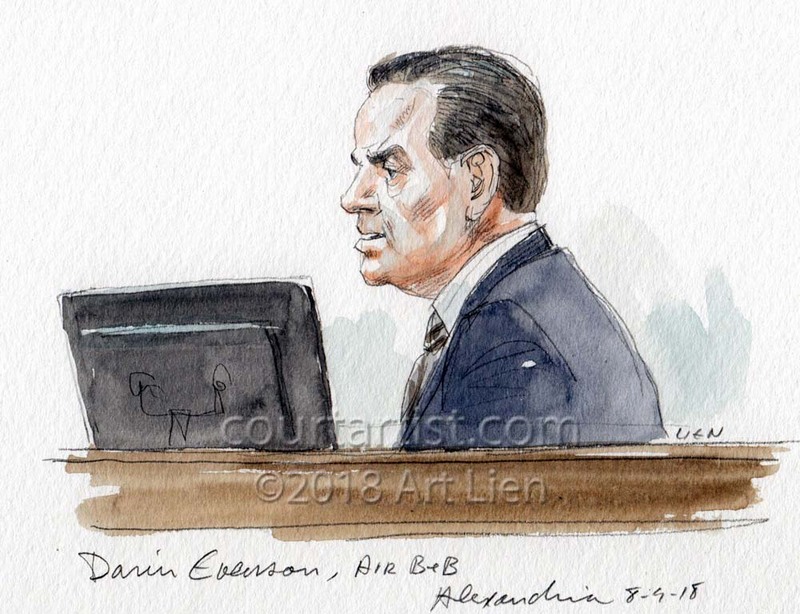 Judge Ellis set a sentencing date of February 8. 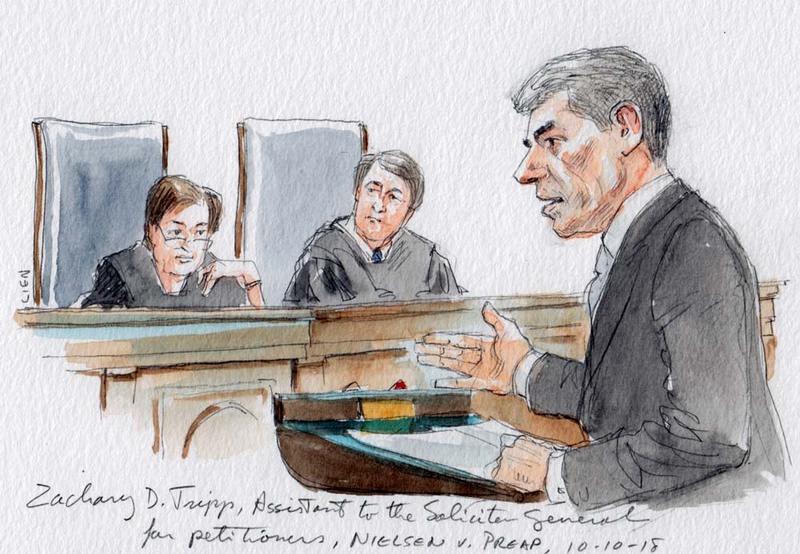 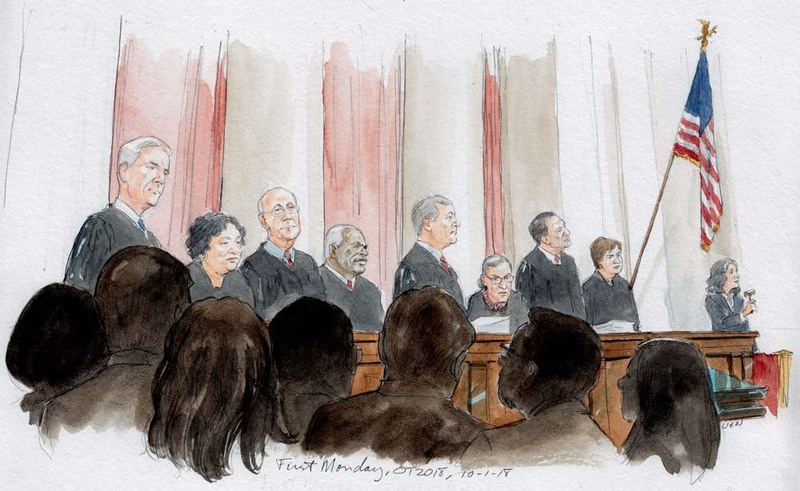 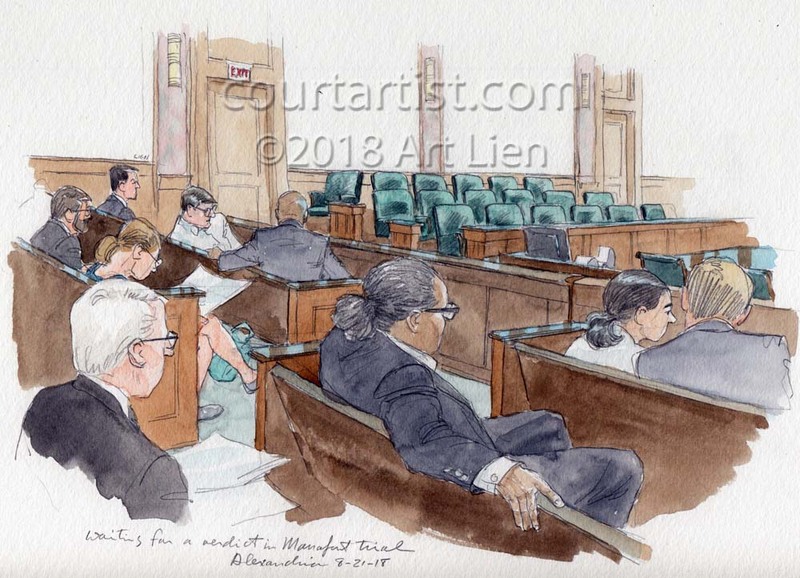 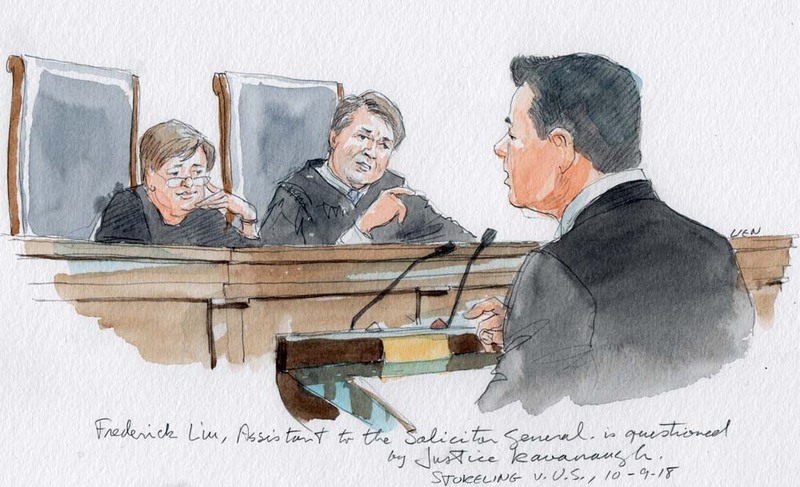 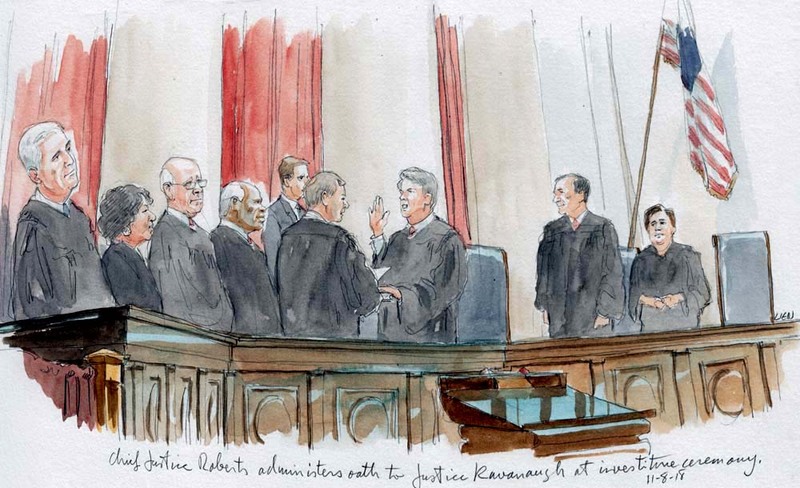 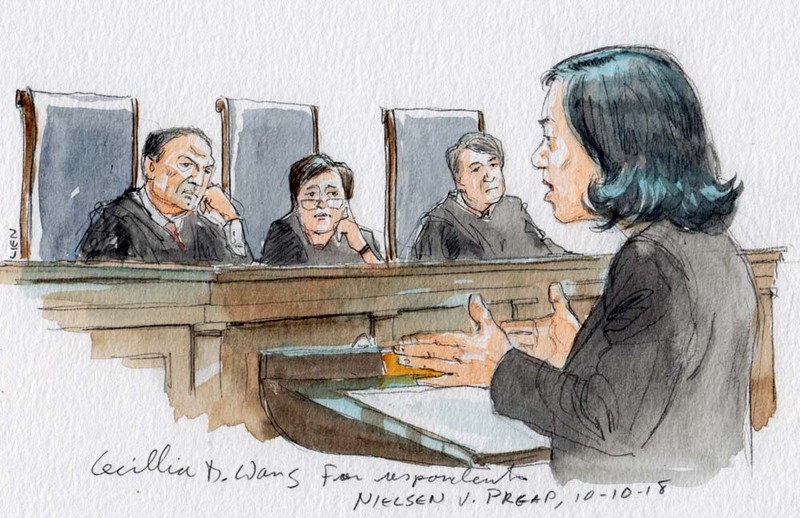 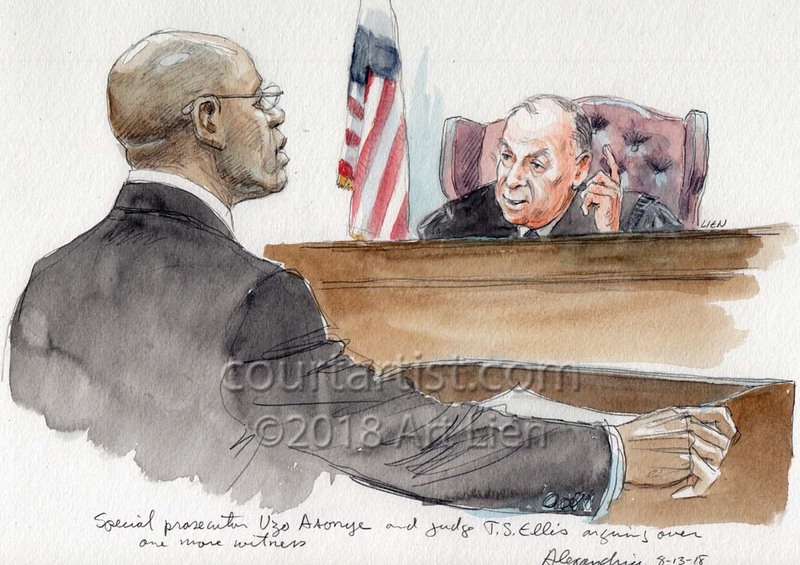 An unusual start to the new term of what can now be truly called the Roberts Court. 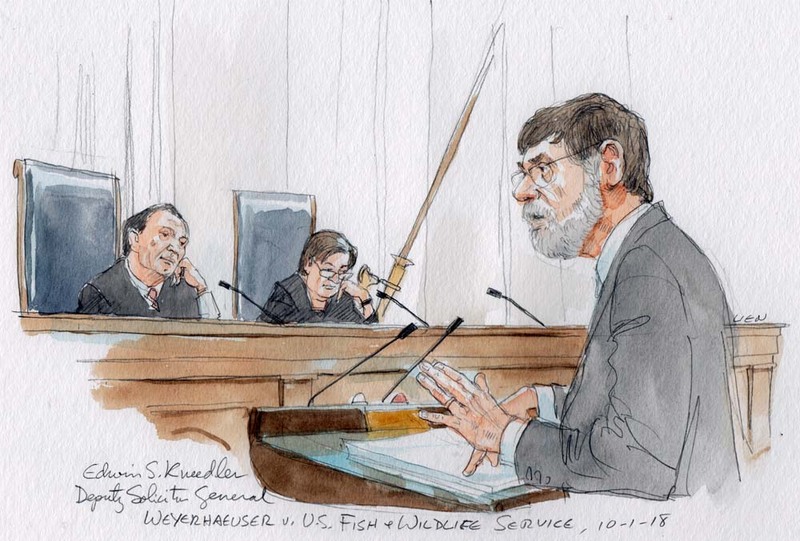 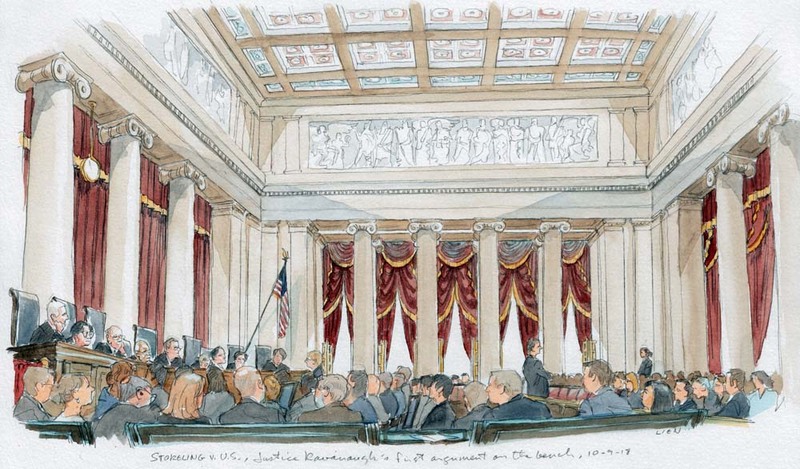 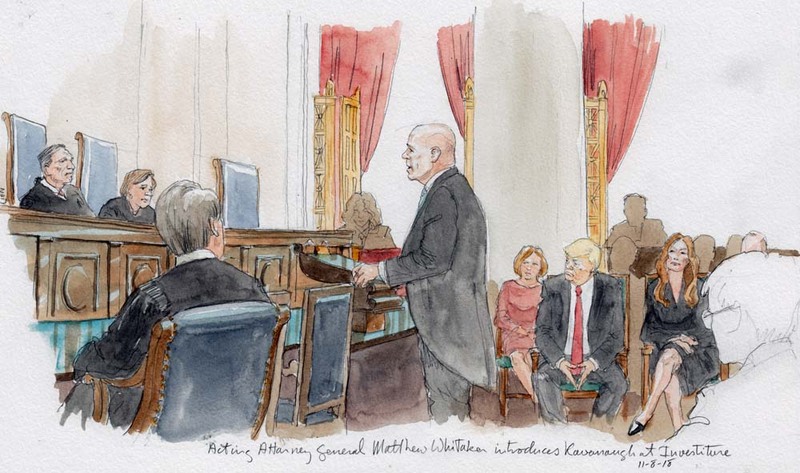 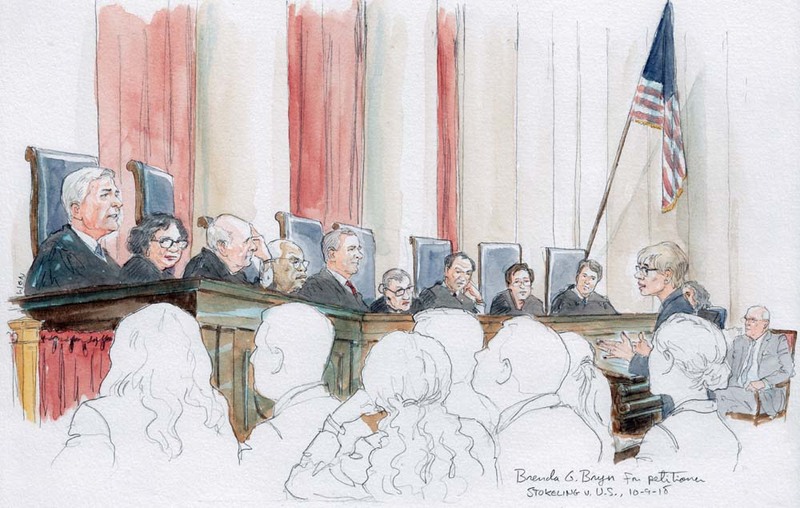 After Justice Kennedy’s retirement the Chief Justice, who on the bench occupies the center chair, now also becomes the center of gravity of the Court as the most likely swing vote. 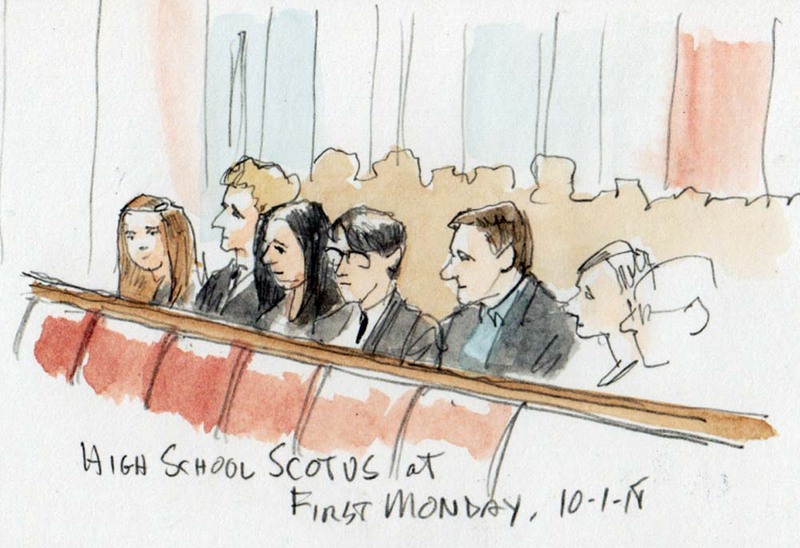 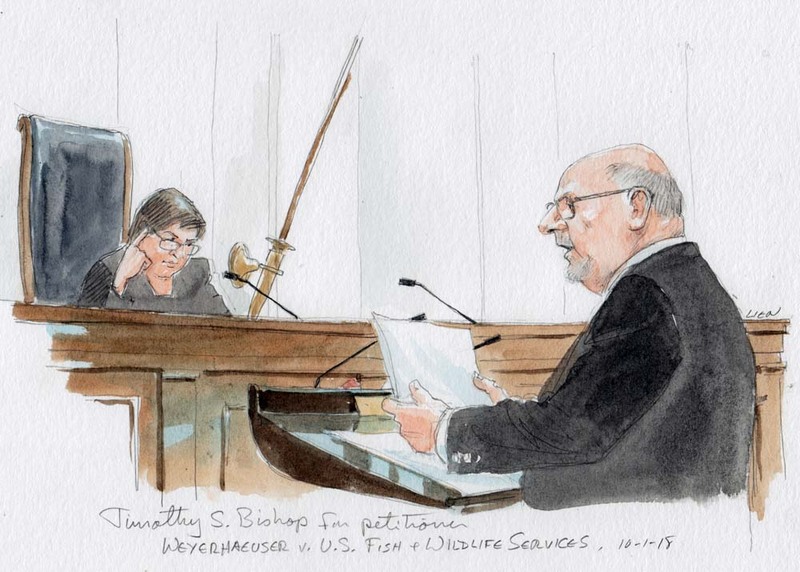 Last week saw eight justices on the bench. 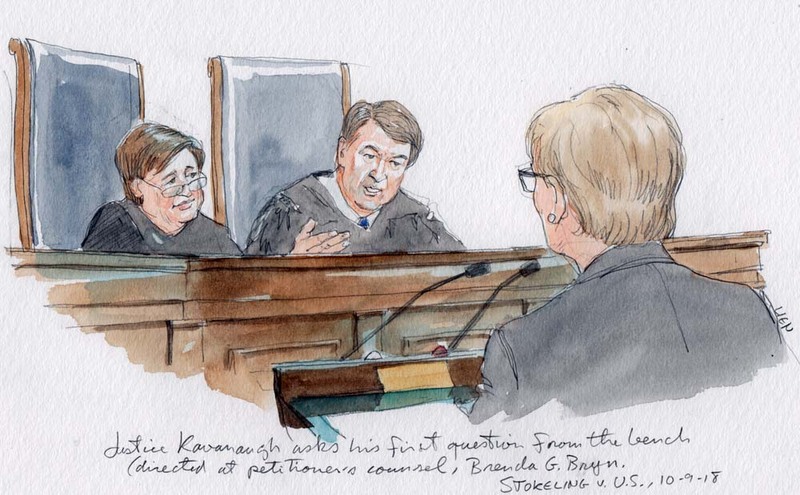 After a weekend Senate confirmation vote followed by a swearing in at the Court, Justice Kavanaugh took his seat on the bench this Tuesday to hear arguments. 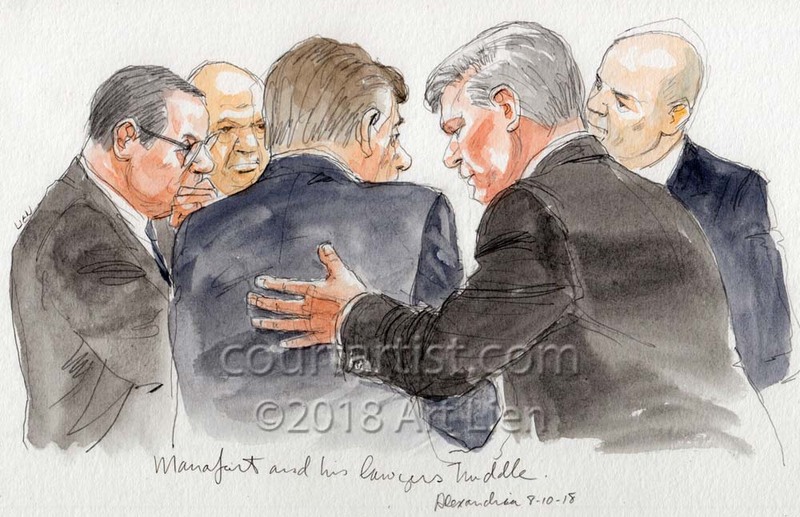 After the drama of the past weeks it almost felt “normal’. 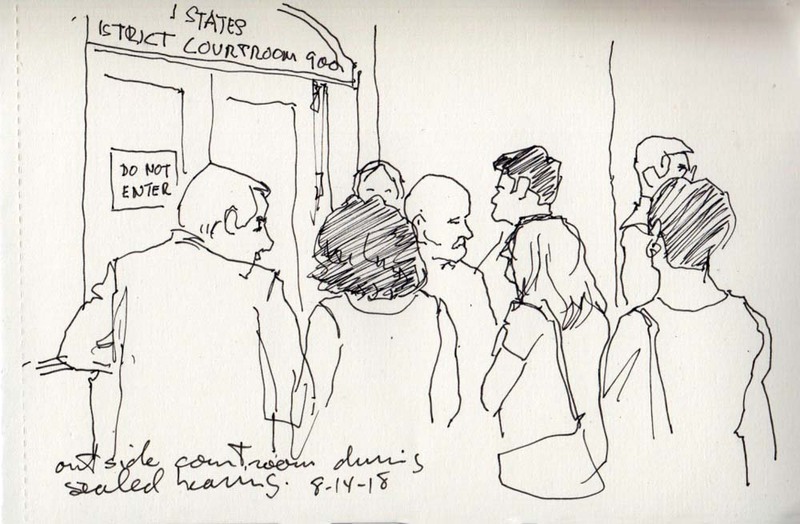 No protesters in the courtroom, nor even on the plaza when I arrived early Tuesday morning though some did show up later. 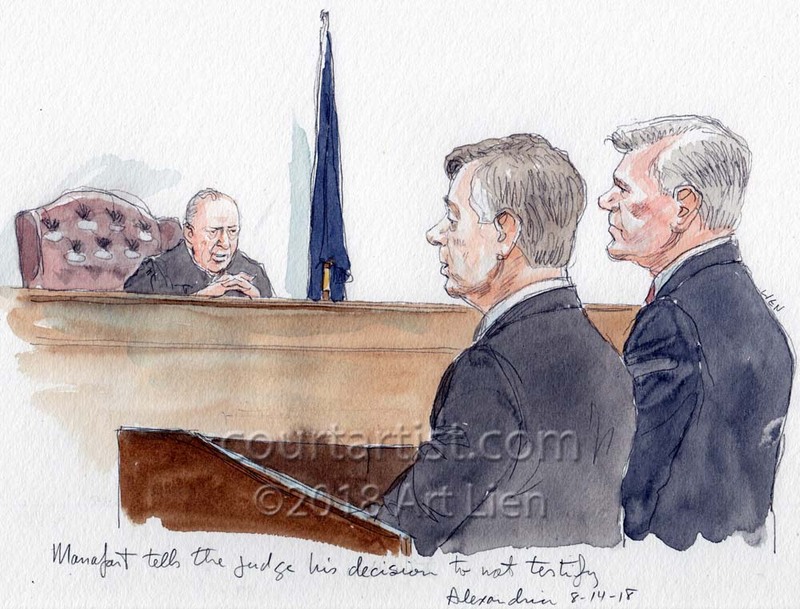 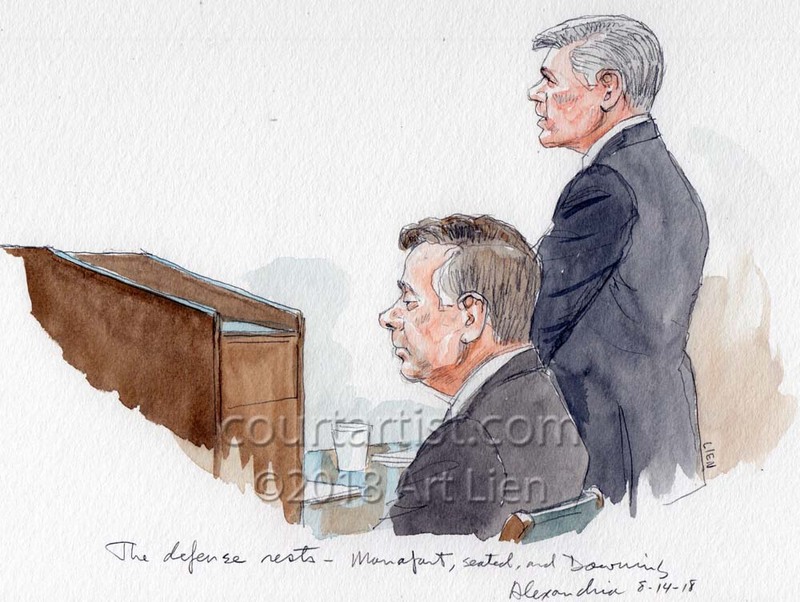 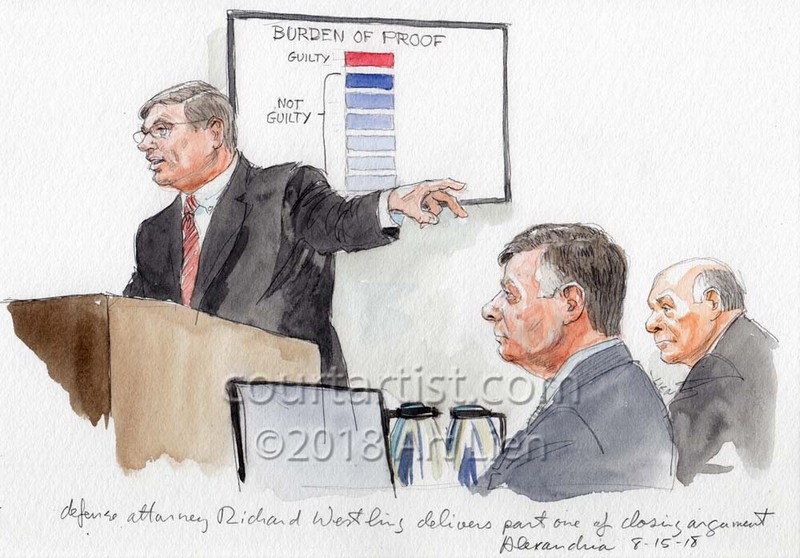 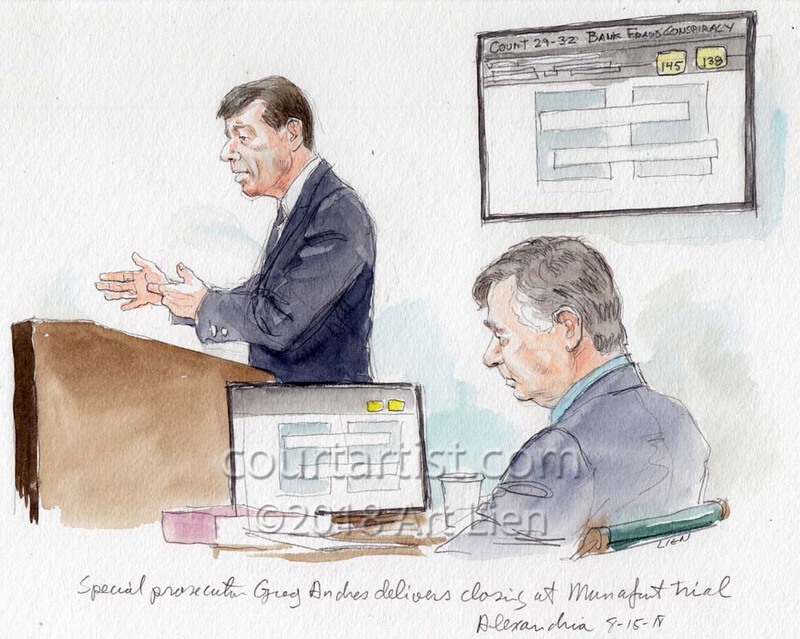 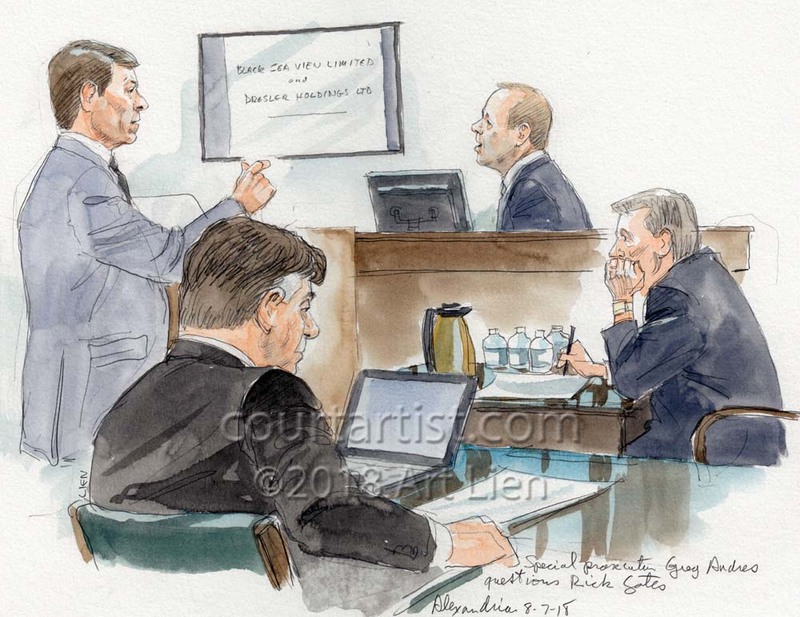 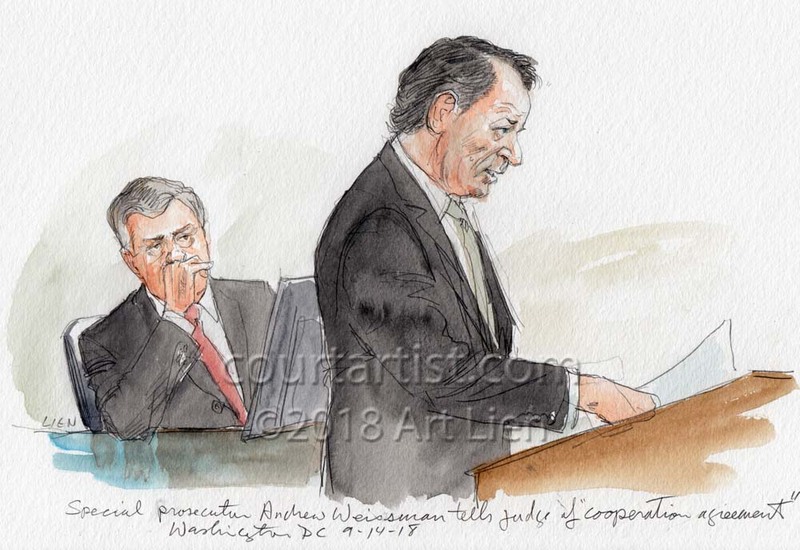 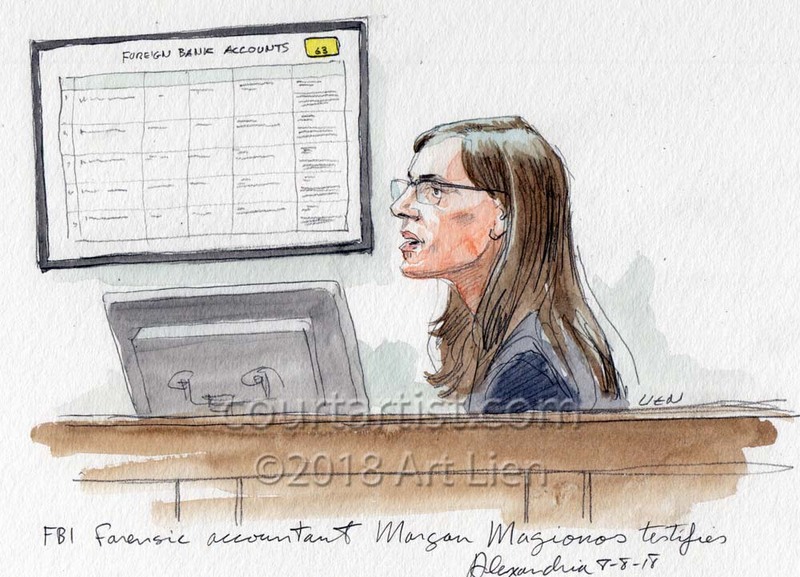 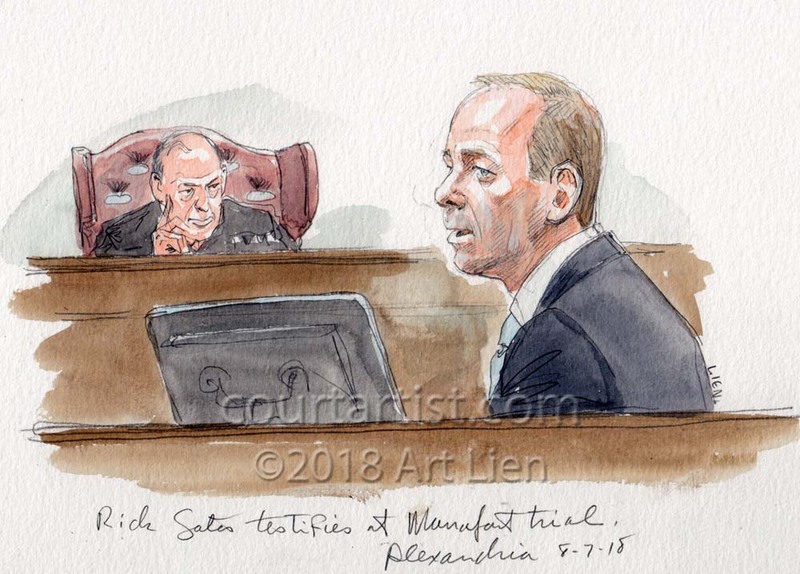 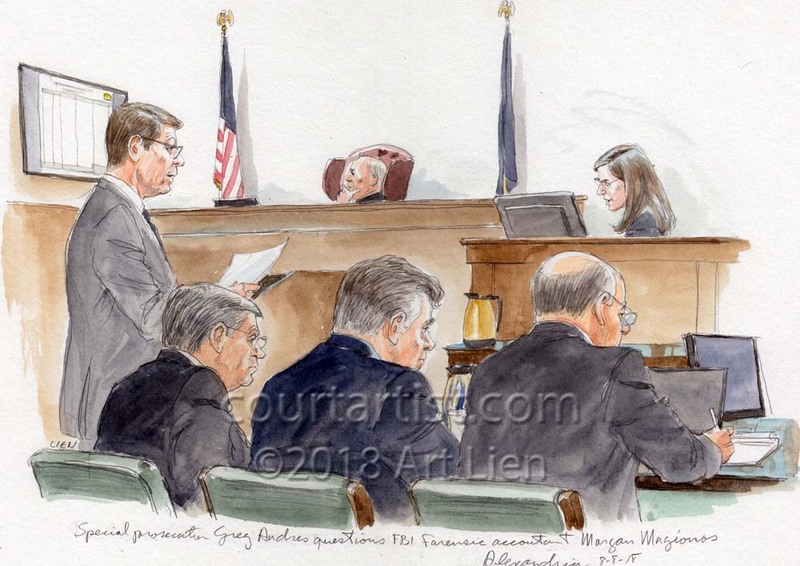 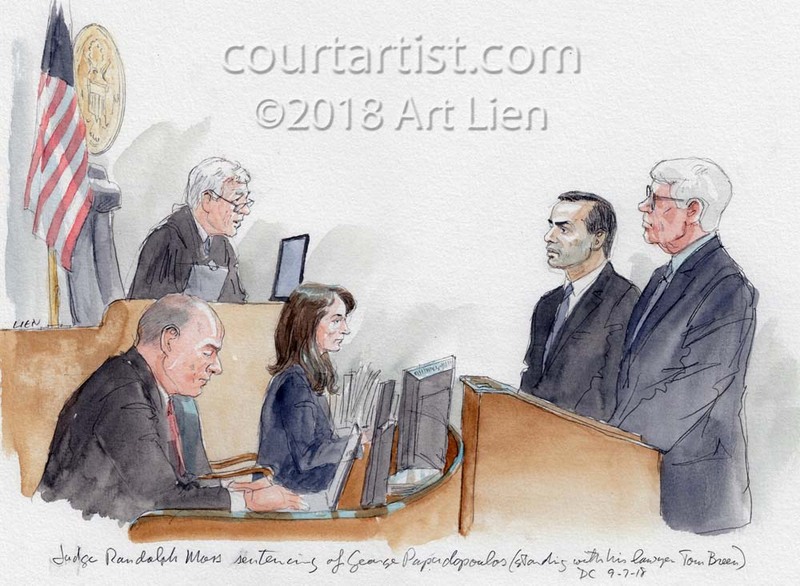 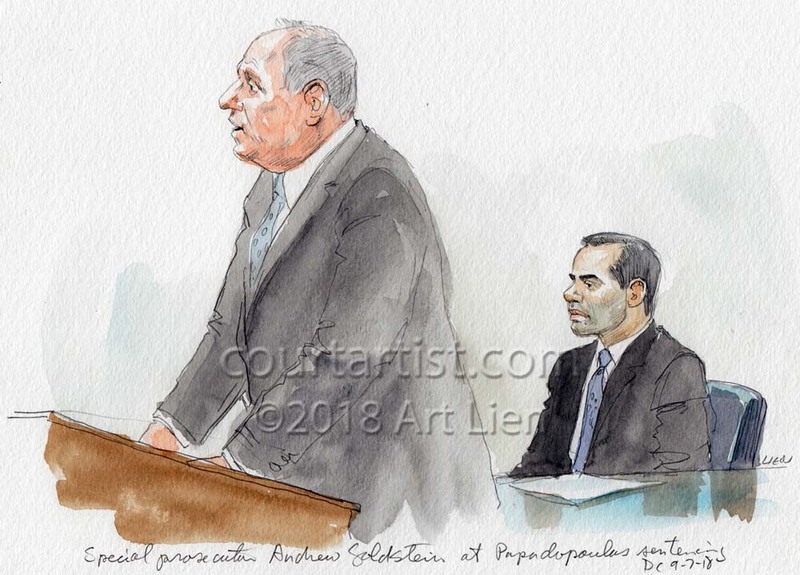 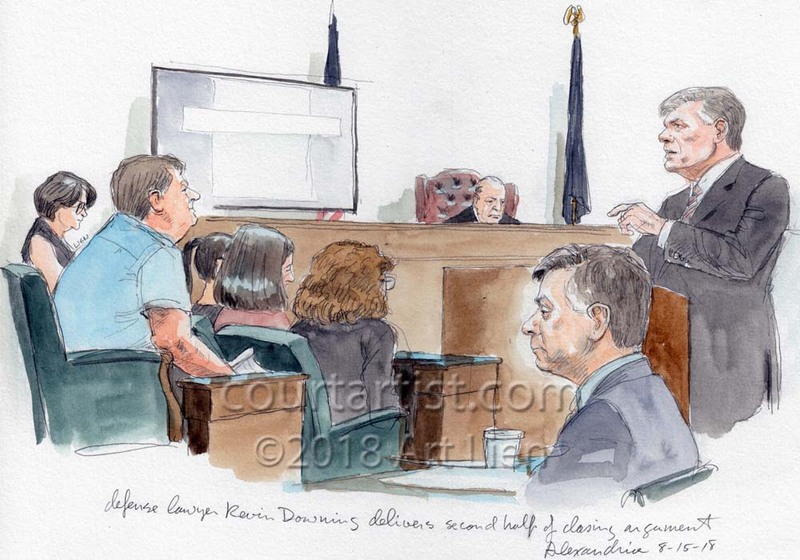 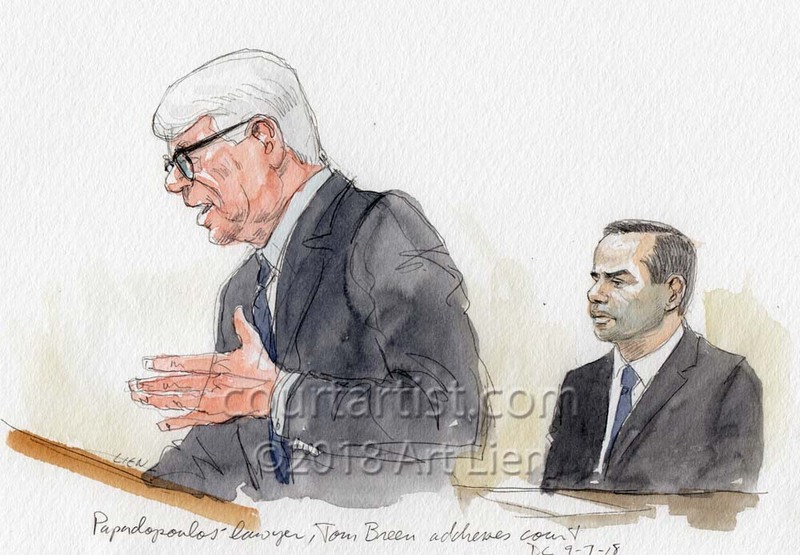 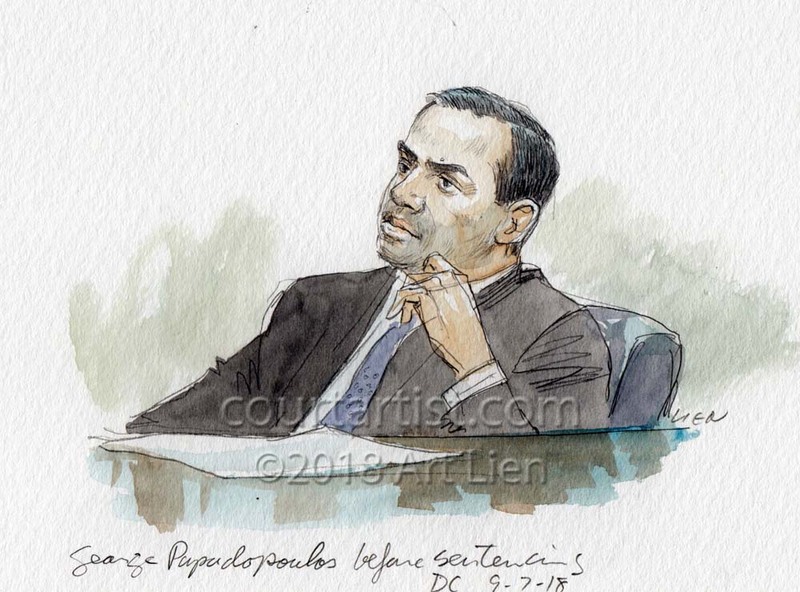 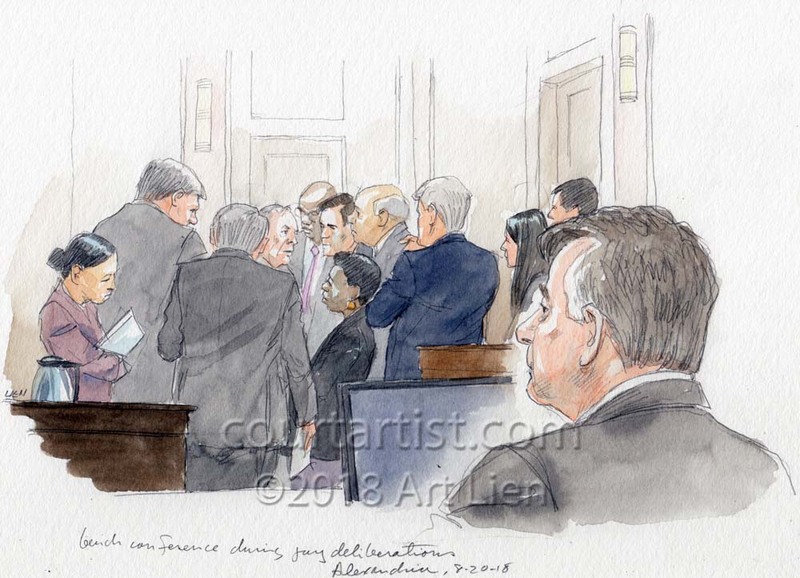 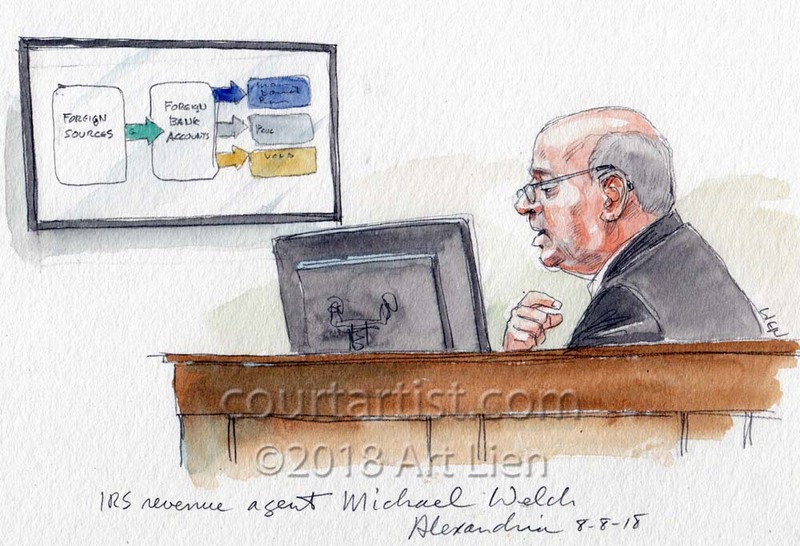 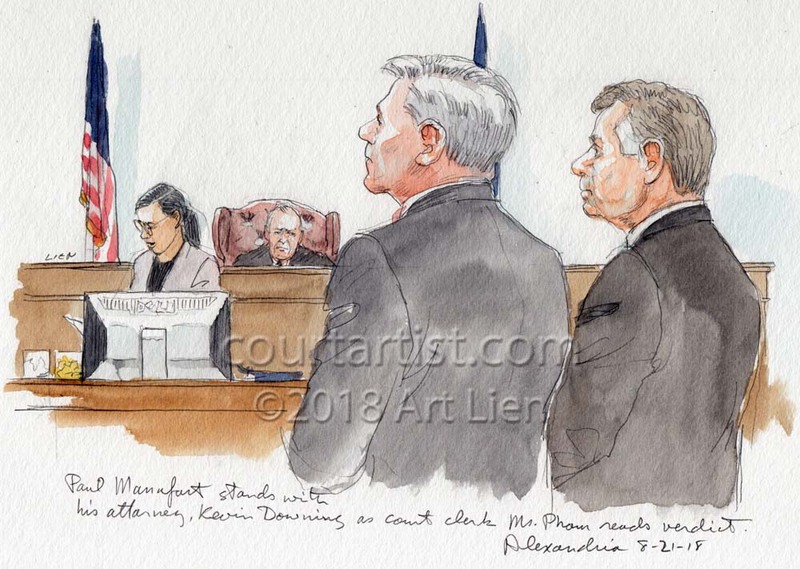 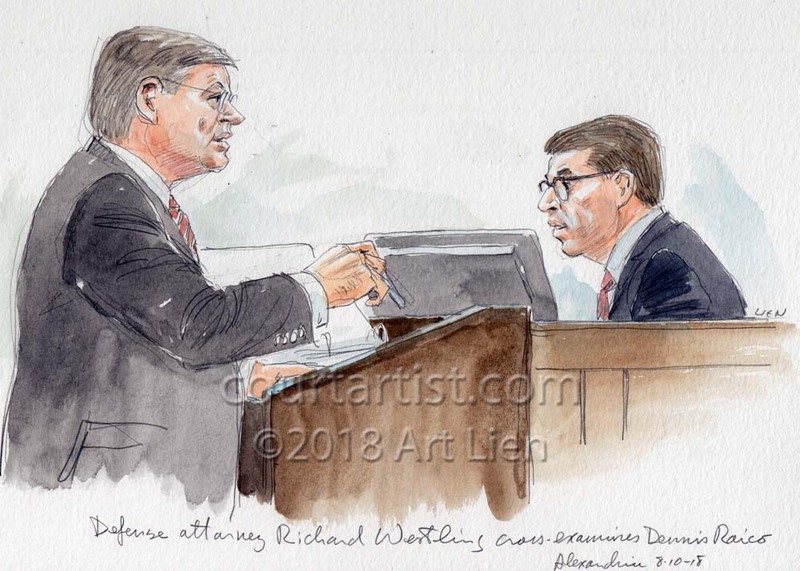 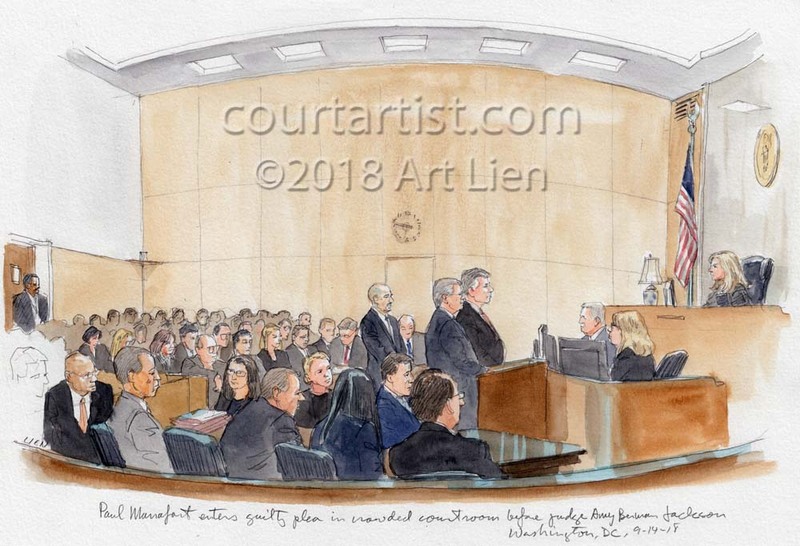 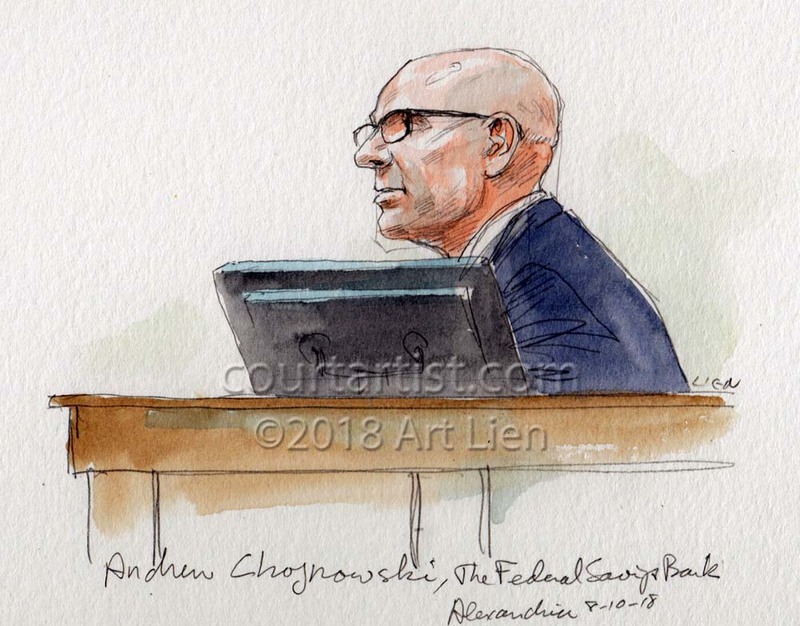 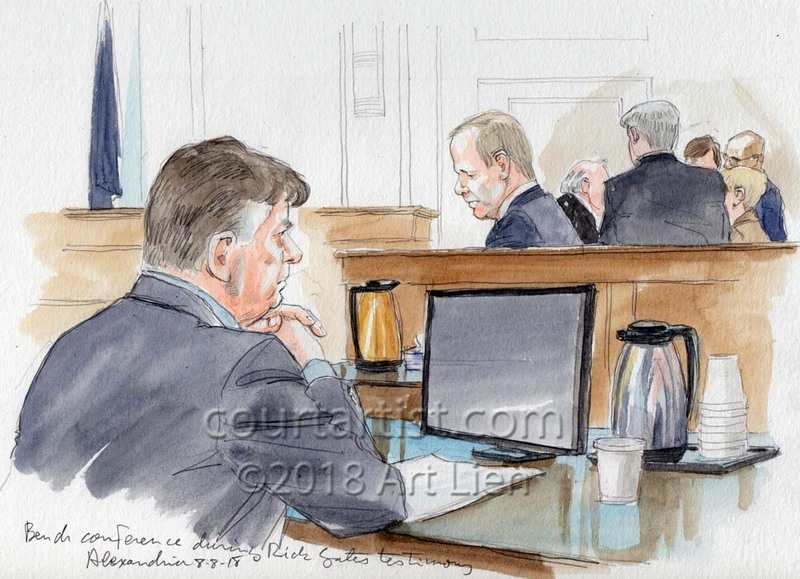 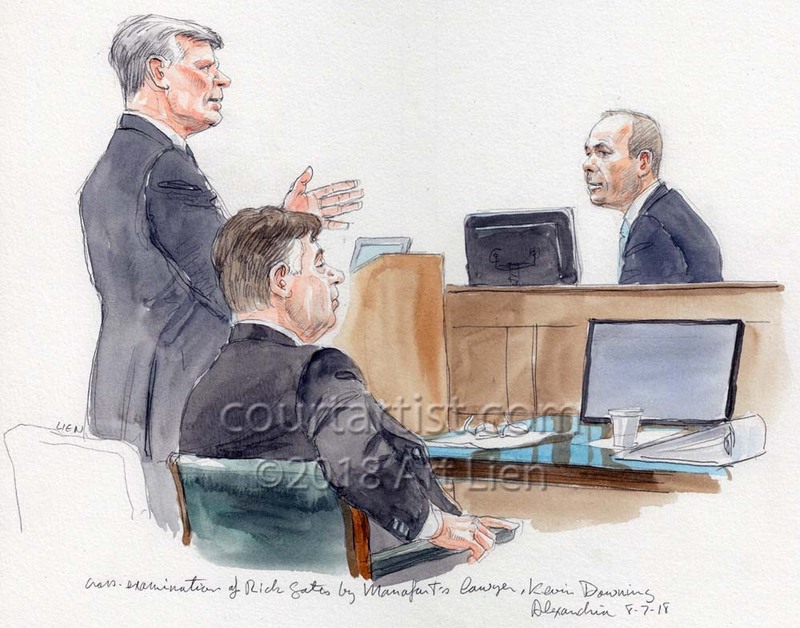 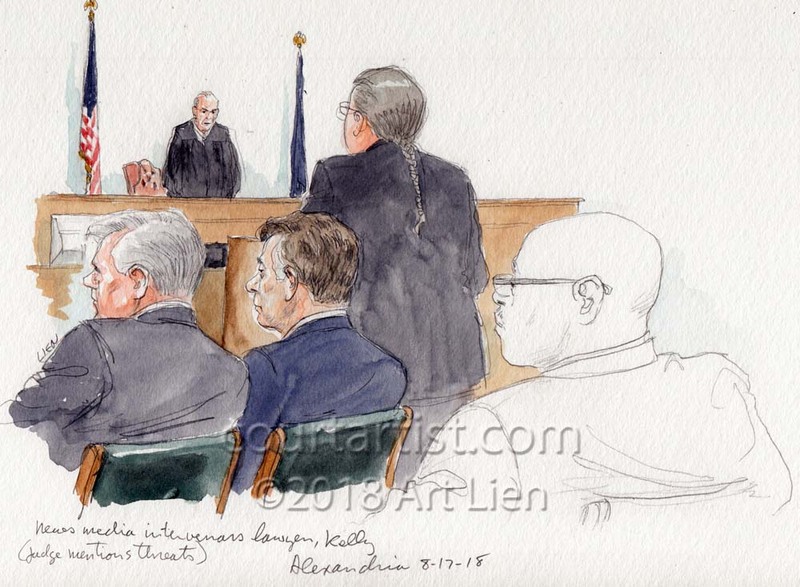 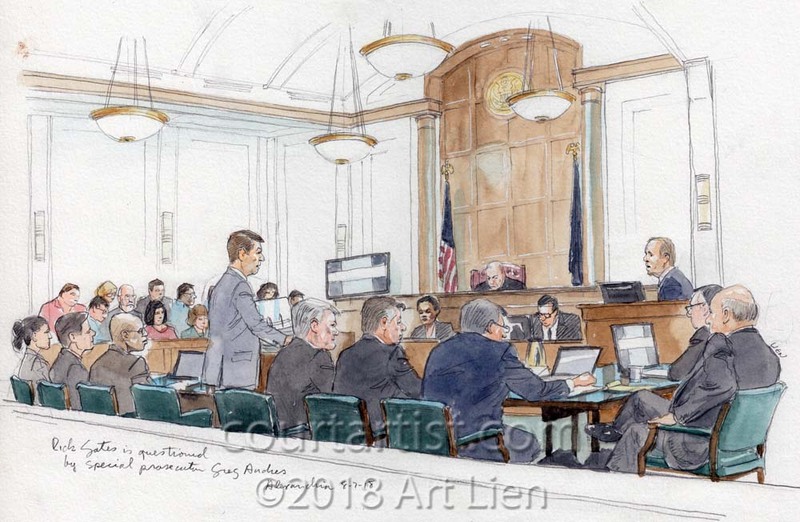 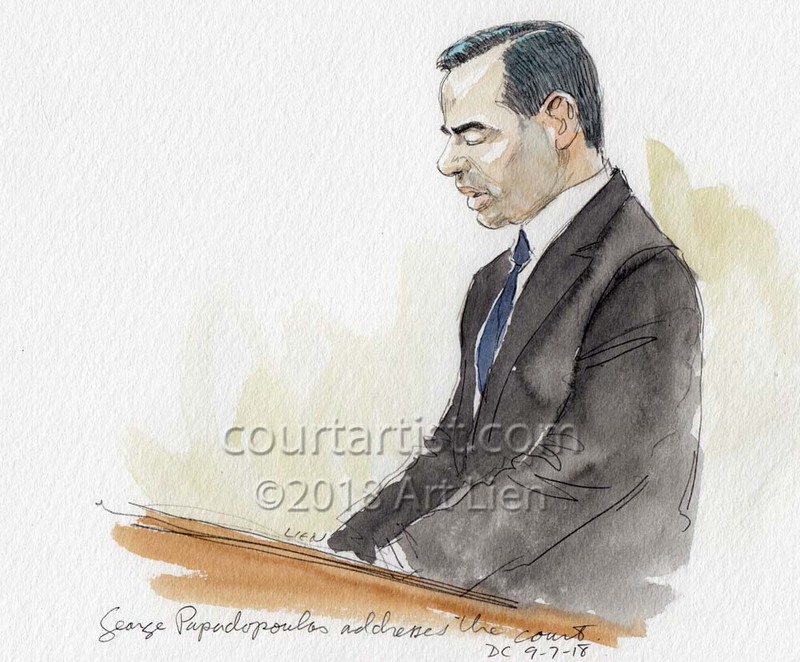 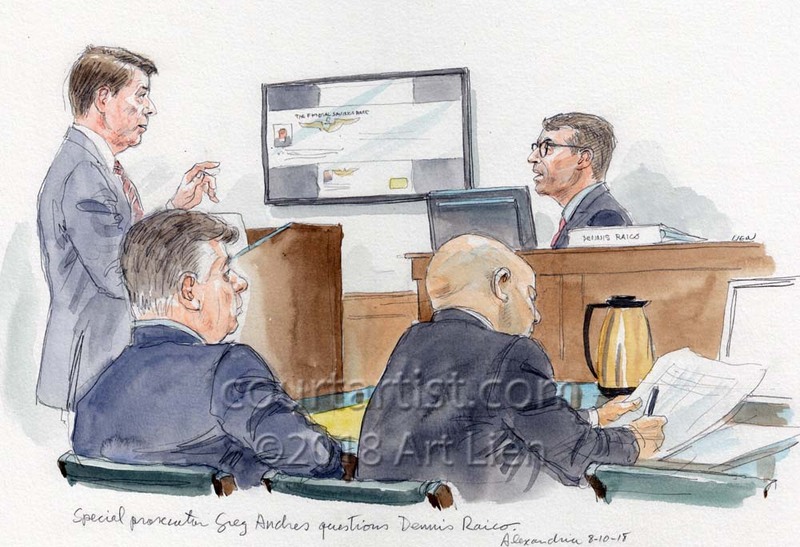 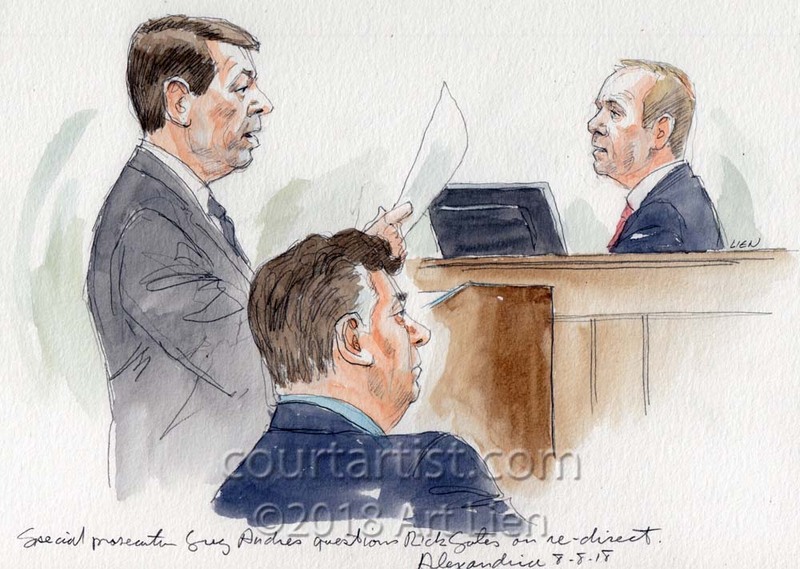 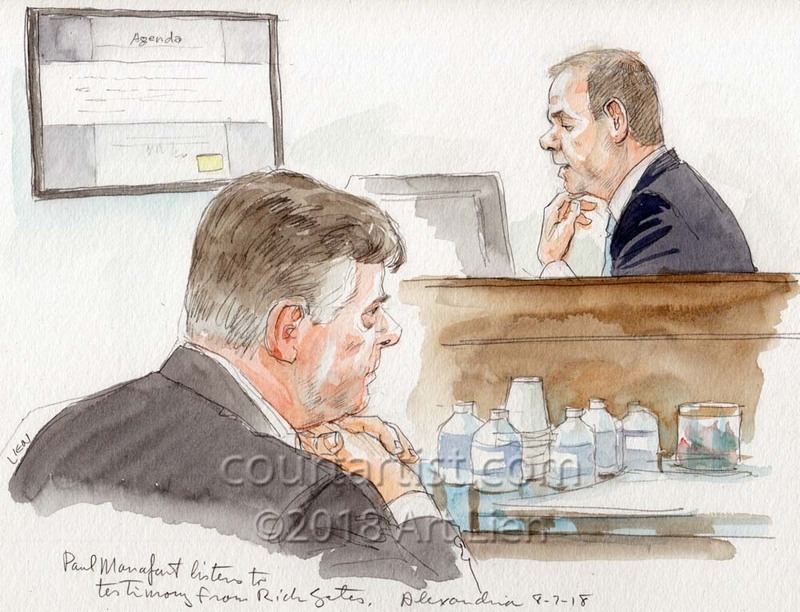 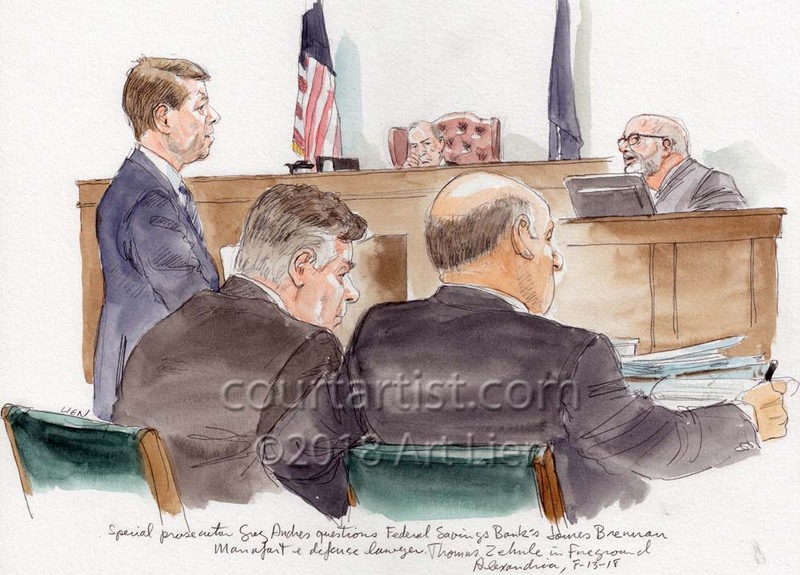 At the end of four days’ deliberations the jury in the Manafort trial in Alexandria returned a partial verdict of guilty on eight of the eighteen counts while remaining hung on the others. 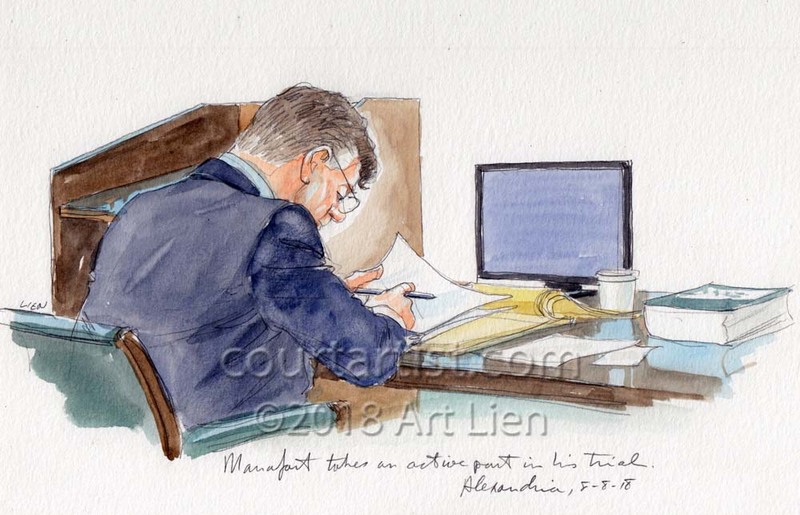 I decided ahead of time to just concentrate on Manafort as the verdict was announced and forgo a wider view of the courtroom. 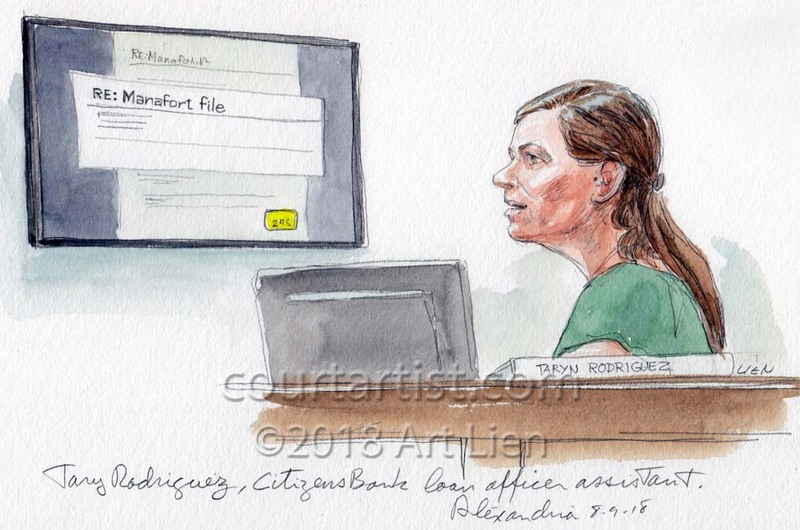 There was really no reaction I could see in Manafort or his wife, just the slightest nod on his way out of the courtroom. 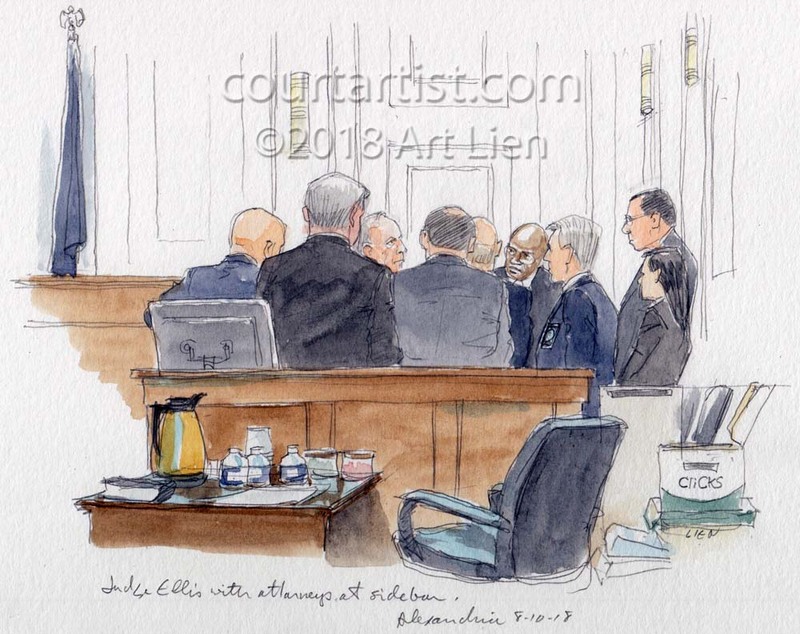 The one sketch I maybe should have done but didn’t, mainly because of the late hour, was of the two lines of lawyers, government and defense, shaking hands as they passed each other as at the end of a baseball game. 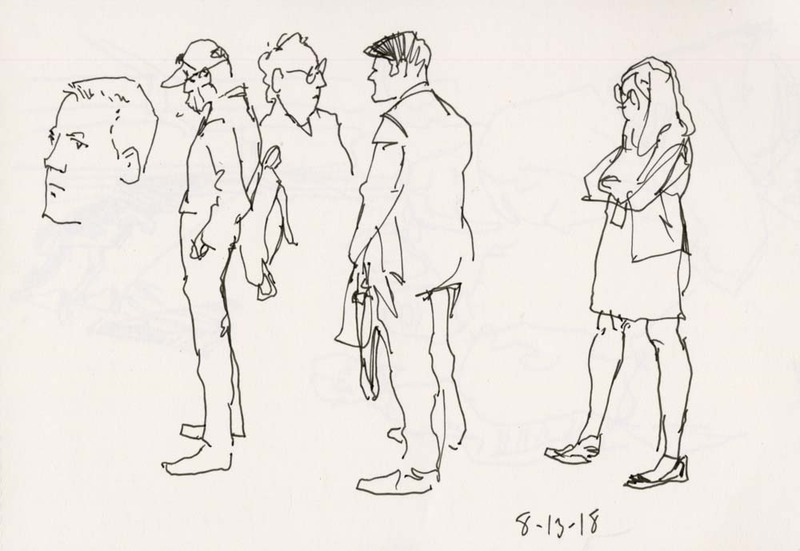 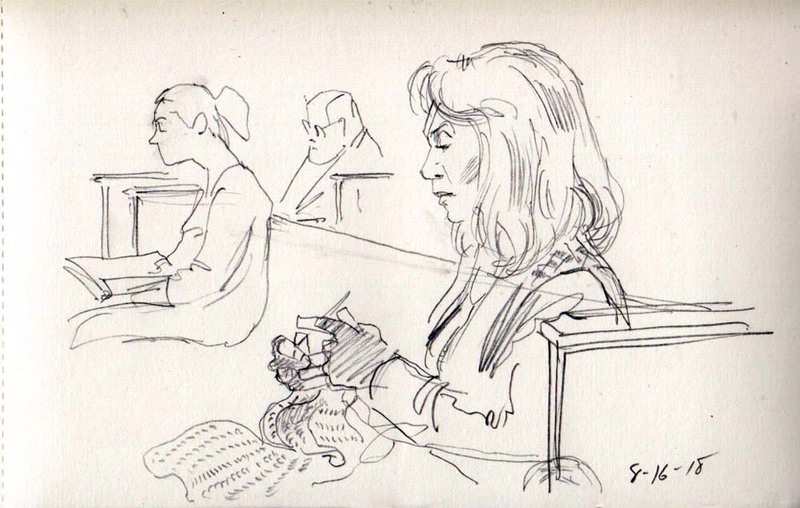 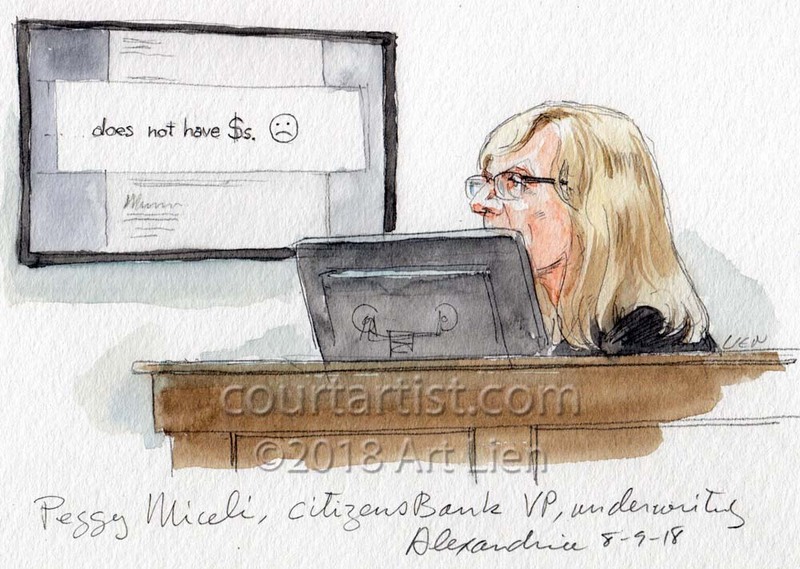 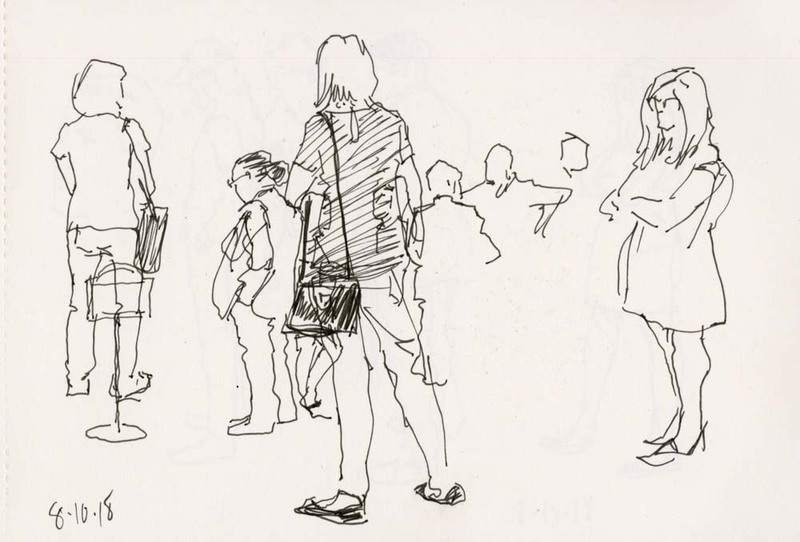 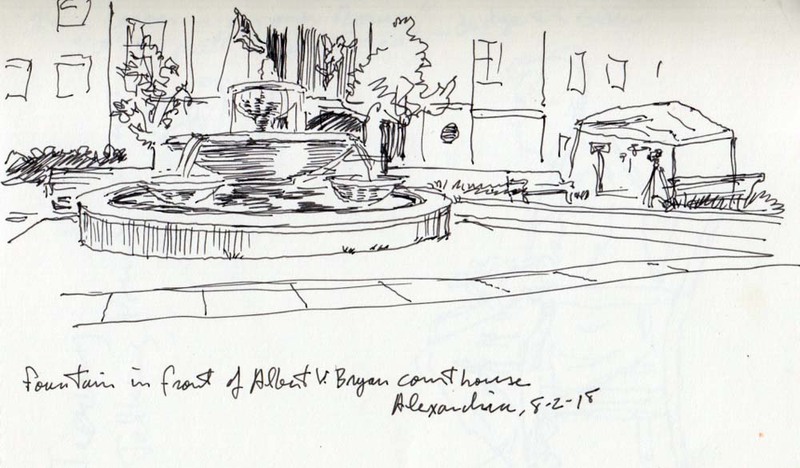 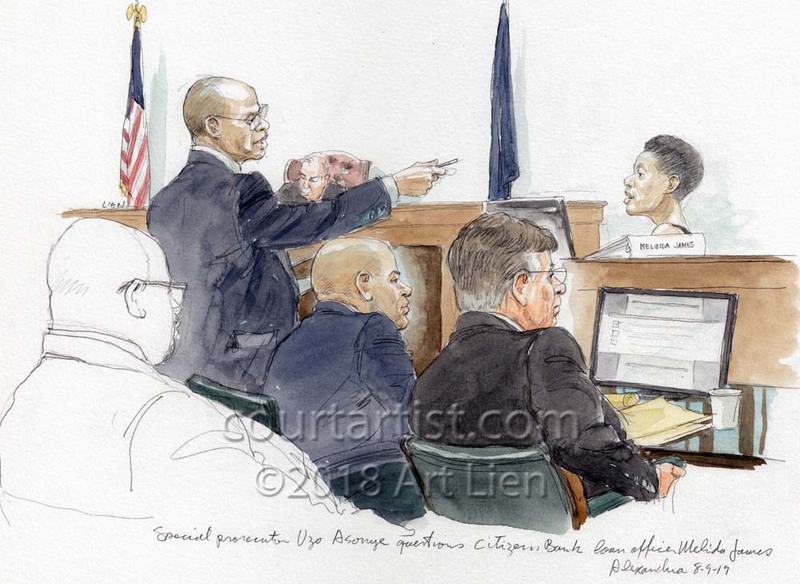 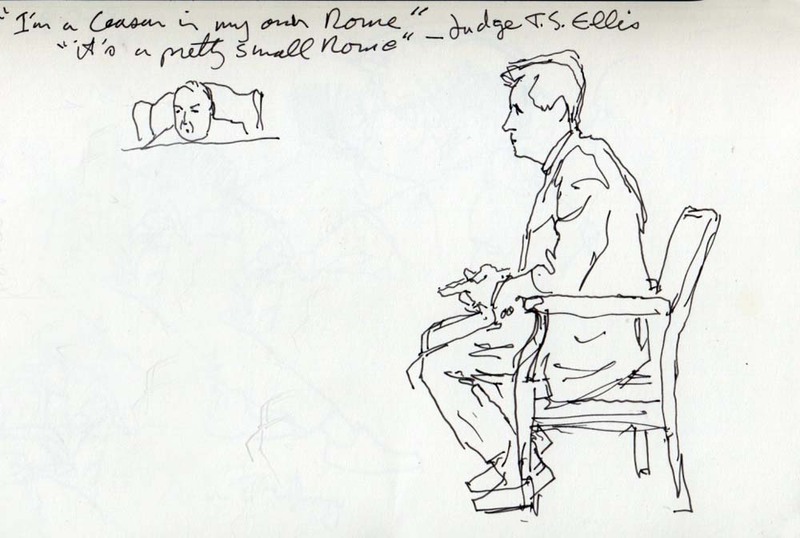 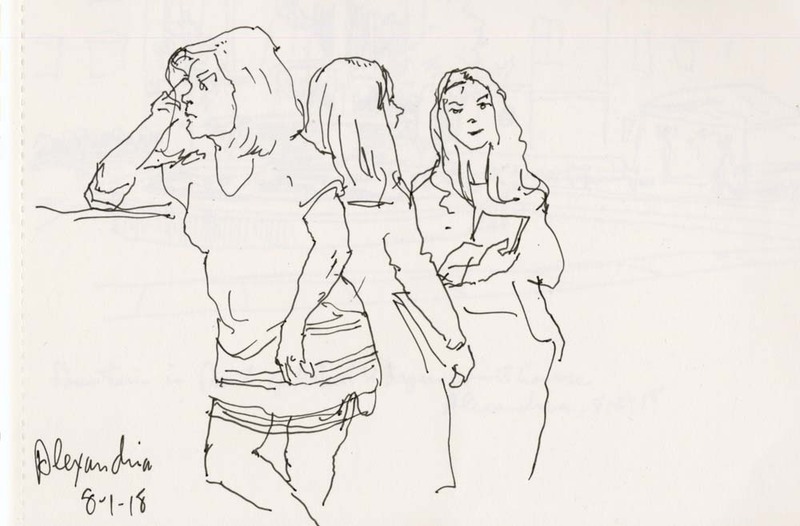 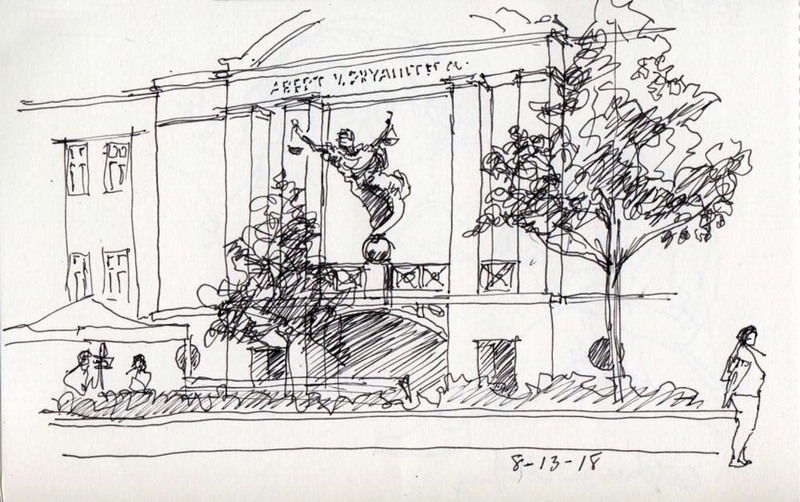 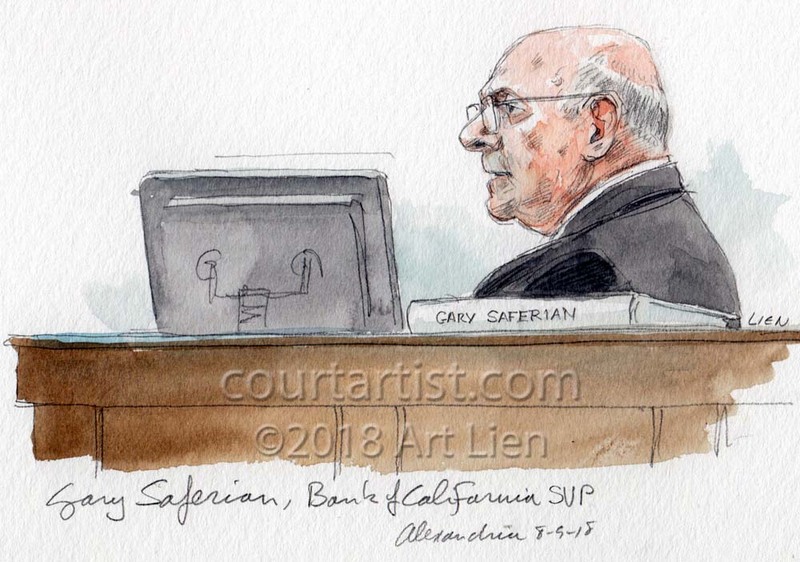 Below are sketches done as we waited for the verdict Monday and Tuesday. 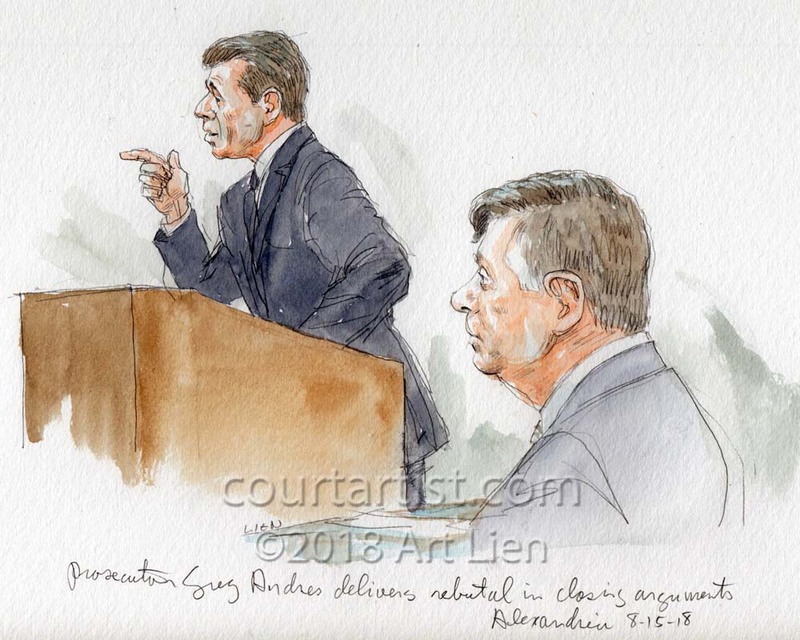 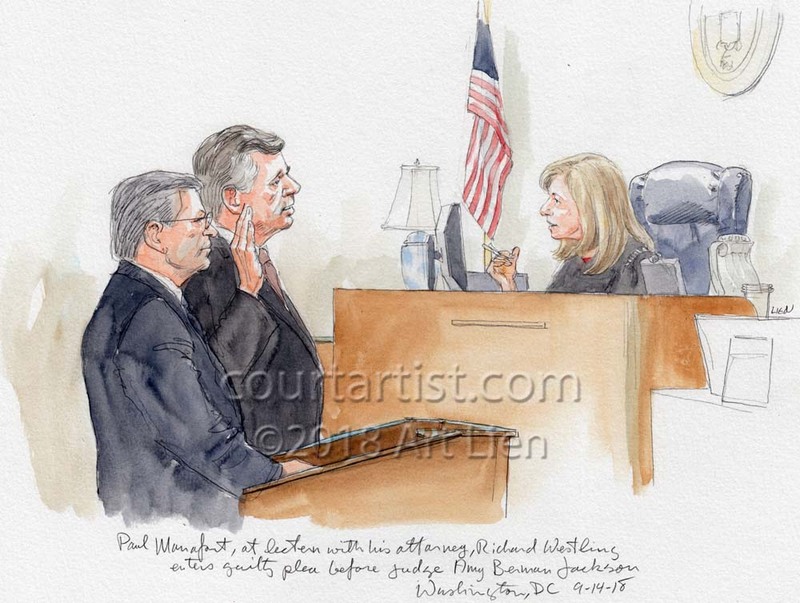 After hearing from two final witnesses and closing arguments the jury in the trial of Paul Manafort began deliberations on Thursday morning. 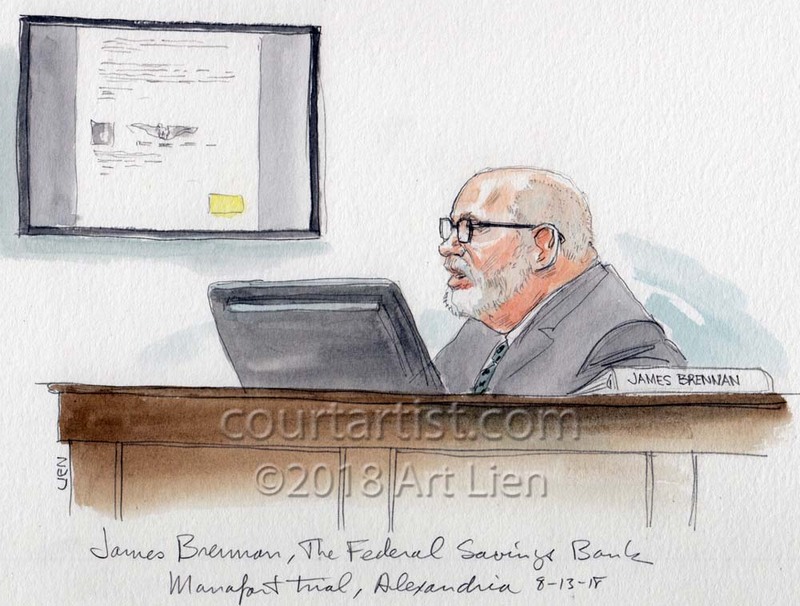 It’s too soon to tell how far along the jurors are though a note on Friday indicating that they wished to work two more hours before recessing and returning Monday morning seems to me to indicate they are still working their way through the counts and evidence . 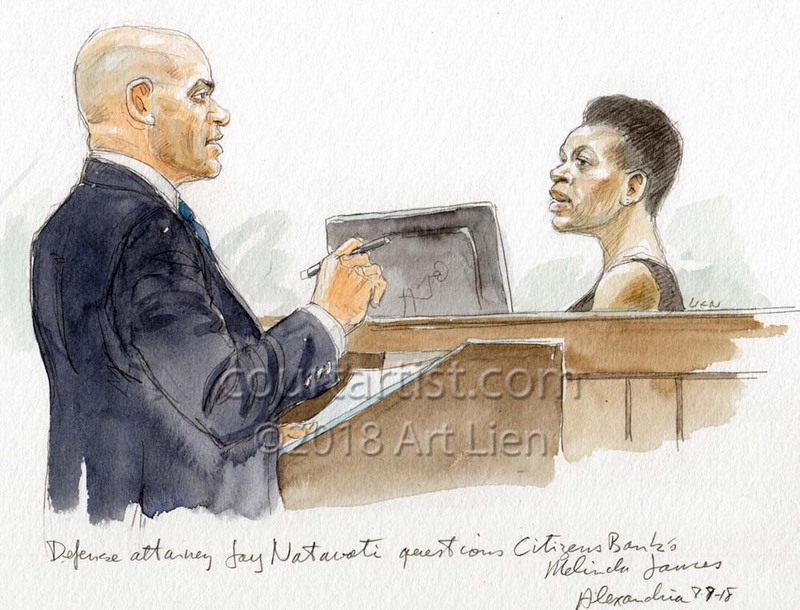 . . but who knows?